The “bard of Tuscany” (New York Times) now offers a lavishly illustrated book for everyone who dreams of integrating the Tuscan lifestyle—from home decoration and cooking, to eating and drinking, to gardening, socializing, and celebrating—into their own lives. • Choose a Tuscan color palette for the home, from earthy apricot tones to invigorating shades of antique blue. • Personalize a room with fanciful door frames, unique painted furniture, and fresco murals. • Create an atmosphere of irresistible, anytime hospitality—a casa aperta (open home). • Set an imaginative Tuscan table using majolica and vintage linens. • Enjoy the abundant flavors and easy simplicity of the Tuscan kitchen, with details on everything from olive oil and vino santo to pici and gnocchi, plus special homegrown menus and recipes. • Make the most of a trip to Tuscany, visiting Frances’s favorite hill towns, restaurants, small museums, and other soothing places. 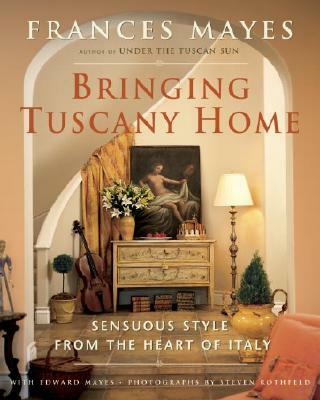 With more than 100 photos by acclaimed photographer Steven Rothfeld (including several of the Mayes’s California home and its Tuscan accents), twenty-five all-new recipes, and lists of resources for travelers and shoppers, Bringing Tuscany Home is a treasure trove of practical advice and memorable images. In addition to the two-million-copy bestseller Under the Tuscan Sun, FRANCES MAYES is the author of Bella Tuscany and In Tuscany; Swan, a novel; The Discovery of Poetry, a text for readers; and five books of poetry. EDWARD MAYES is the author of six books of poetry. They divide their time between the San Francisco Bay Area and Cortona, Italy. STEVEN ROTHFELD’s photos appear in Frances Mayes’s annual “Tuscan Pleasures” desk calendar, and he has illustrated many books and calendars, including his own French Dreams, Italian Dreams, Irish Dreams, and Entrez. He lives in California’s Napa Valley.